Growing up in Greenwich Village, Sean Wilentz discov­ered the music of Bob Dylan as a young teenager; almost half a century later, he revisits Dylan’s work with the skills of an eminent American historian as well as the passion of a fan. 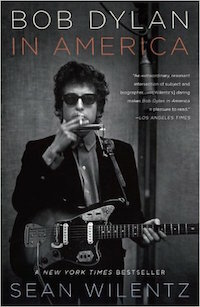 Drawn in part from Wilentz’s essays as “historian in residence” of Dylan’s official website, Bob Dylan in America is a unique blend of fact, interpretation, and affinity—a book that, much like its subject, shifts gears and changes shape as the occasion warrants. Beginning with his explosion onto the scene in 1961, this book follows Dylan as he continues to develop a body of musical and literary work unique in our cultural history. Wilentz’s approach places Dylan’s music in the context of its time, including the early influences of Popular Front ideology and Beat aesthetics, and offers a larger critical appreciation of Dylan as both a song­writer and performer down to the present. Wilentz has had unprecedented access to studio tapes, recording notes, rare photographs, and other materials, all of which allow him to tell Dylan’s story and that of such masterpieces as Blonde on Blonde with an unprecedented authenticity and richness.